Google’s announcement of its new Google Container Engine, a managed service version of its open-sourced Kubernetes container-management system, shows that the search giant believes it can lure new customers to its cloud through its container expertise. But, it’s clear from talking to various attendees at Google’s Cloud Platform event that while many people are interested in an enterprise-version of Kubernetes, questions of container security, ease of use on different cloud platforms and stability need to be ironed out before folks are ready to sign up. Although the service is only available in alpha, meaning that it’s being tested to see whether it can handle mass adoption, it’s obvious that Google is targeting enterprise clients who might be wary of trying out open-source products. Greg DeMichillie, Google’s director of product management for its cloud platform made it clear that Google feels containers “are the center of disruption” when it comes to modern-day computing and application development; if you are a company that’s not on top of current trends, you risk falling to the wayside as the airline industry did during the 1980s when it came to PCs, he said during the keynote. Google wants to show the enterprise world that it can trust it when it comes to container technology, and DeMichillie mentioned at several points how Google engineers helped create control groups (or, “cgroups”), a feature of the Linux kernel that distributes operating system resources to a container. 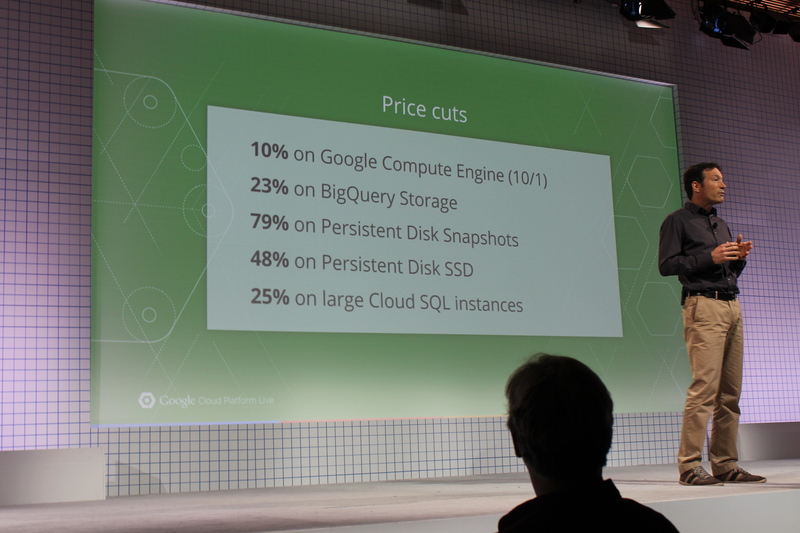 Joerg Helig, ?VP Engineering, Cloud Developer Experience at Google, announces Google Cloud price cuts onstage at Google Cloud Platform. Still, it’s going to take some time for enterprises to jump on the container bandwagon, no matter how much Google wants to show off that it has ten years of experience managing and scheduling containers in its infrastructure. With Kubernetes only available in alpha, we’re probably a year out from when the engine will be ready to run in production, said event attendee Nate Witte, lead developer at the digital agency Grow. Witte’s company runs on the Google Cloud and he’s wary to try out Google products that are in beta, because the search giant can change or remove key features without any notice during these early stages. For Rajiv Ranganath, a product leader of a stealth startup called Atihita, questions around the security of containers have caused him to gauge his excitement ([company]Docker[/company] recently discovered some issues with the Poodle bug, but fixed those problems with an update last week). “I don’t quite understand the security aspects [of containers],” said Ranganath. While DeMichillie said at a press conference after the keynote that containers running inside a virtual machine are safe because VMs are supposedly secure, Ranganath was not fully convinced and said that Google has been a bit “wishy washy” when it comes to fully explaining how containers can really be safe enough for mission-critical workloads. Part of the allure of containers is the fact that they can be easily moved from cloud to cloud, thus making it easier to build and maintain complex applications with many different components across a big environment. 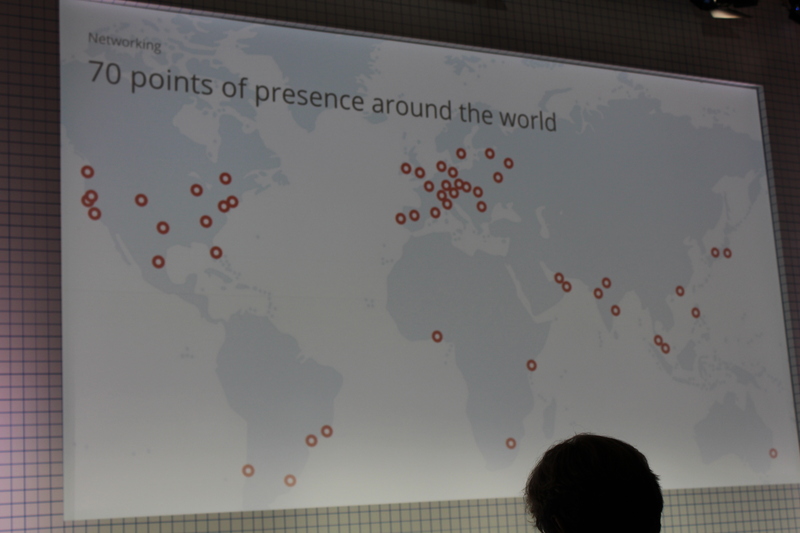 Unfortunately, people interested in giving the Google Container Engine a test drive will not be able to use any other public clouds, like Amazon Web Services or Azure, said DeMichillie during the press conference. Being stuck with one public cloud sort of limits the capabilities of containers, but DeMichillie hinted that the Google Container Engine could one day be used across multiple clouds like Kubernetes can. “Stay tuned to Container Engine as it develops,” DeMichillie said. What makes Kubernetes seem so special is how it’s bringing together so many different companies (and competitors) to band behind a container-orchestration standard. If the Google Container Engine can’t play nice with other systems, then part of the allure of using containers in the first place goes out of the window. “I think the best advantage of containers are the ease of install and getting it running on the public cloud,” said Carlos Rojas, an independent developer. It should be noted that we are still in the nascent stage of the mainstream adoption of containers, however, so it’s anyone’s game as to who will eventually dominate the space. But one thing’s for sure, having a system that’s not closed and proprietary will probably be the best way to gain that coveted developer-user base. “If the container engine is easy to integrate with different platforms, I’m definitely going to look into it,” said Richard Xu, a sophomore at University of California, Berkeley.